Type the “Merchant ID”, “Public Key” and “Private Key” (Which you have received after you signed up with Braintree) in the corresponding fields. By default, all your transactions will be presented and settled in your home currency, and if necessary, the customer’s bank will convert the charge to the customer's home currency. This method requires no additional work to set up. This is suitable for you if most of your transaction volume is domestic. You may want to consider presenting and/or settling in Multiple Currencies if your business caters to international customers. If you want to know how to setup “Multiple Merchant Account IDs in Different Currencies", then Click Here. Currently, we don't have any User Interface(UI) in our CMS to add Multiple Currencies for Braintree. So, if you want to configure multiple currencies, then you need to add a support ticket. 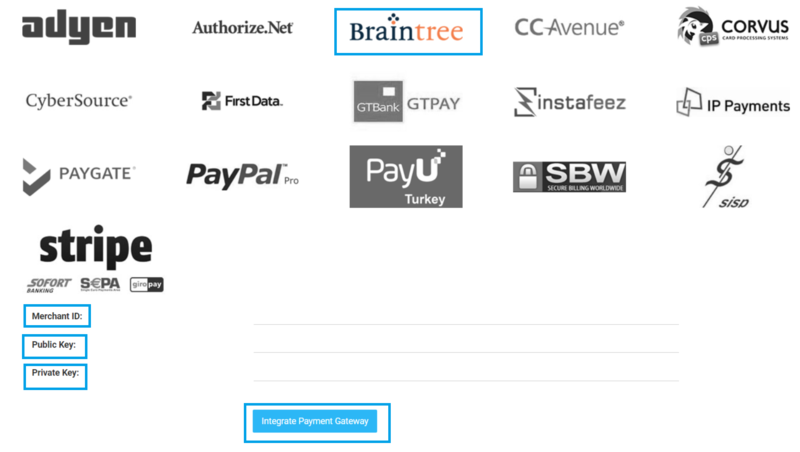 Braintree supports payment methods including, Subscription and onetime payment methods including PPV, PPV Bundle and Pre-Order. You can create a Sandbox Account to test your payment gateway. After creating the sandbox account you need to provide us the details (i.e. “Merchant ID”, “Public Key” and “Private Key” ) to integrate the sandbox account in CMS.